Discussion in 'Mech Tech' started by CSI_Will, Apr 26, 2012. I'm currently doing a full interior overhaul - completely gutted the inside with a view to putting in a new floor, cabinets, utilities and bed. 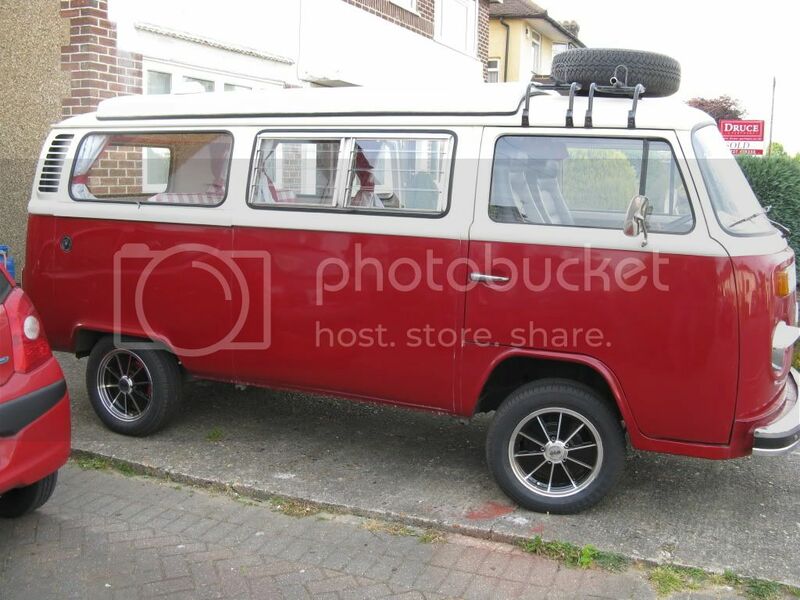 I have a RHD camper (sliding door on nearside) with a straight-up pop top devon roof. My plan is to run cabinets all alongside the offside of the van (which will incorporate sink/hob/fridge/electrics) - from behind the driver's seat right to the tailgate with an overhead locker and wardrobe. A 3/4 rock and roll bed will be nearest the sliding door side. Problem I have is the spare wheel which sits in the back inside the tailgate behind the rear nearside wheelarch - it will be taking up valuable bed space. Any ideas on where I can relocate it to? I've read that the front panel is not designed to hold a spare wheel, so am not keen on putting it there (don't really like the look of it there either), only other place I can think of is on the roof above front cab using a roof rack. Or should I ditch it and just buy a can or two of tyre weld!? 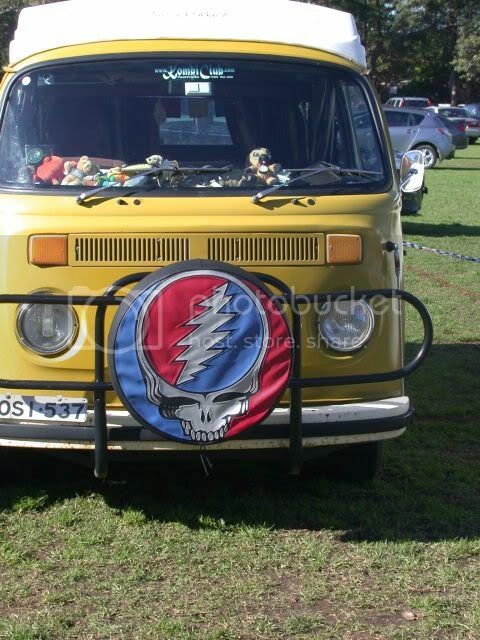 What about a rear mounted spare wheel carrier like some devons had originally? On a roof rack is easy as long as you dont need it on a dark wet night on the side of the M4. Front panel isnt a good idea. You can get rear carriers that look ok. Personally I carry mine where it was designed to go and just chuck it under the bus when I get the bed out. A lot dont carry one and just carry tyre weld. Thats why I carry a spare! Tyreweld also makes the tyre unrepairable. This is where you win with a left hand drive where your wheel can be built into cupboards around the wheel well, or cupboards stopped short of the wheel well, leaving the rest clear for sleeping. Or get an Aussie bull/roobar & mount it there. I put mine on the roof. Seems all good to me. Although I haven't yet had a puncture in the dark on the M4 so it might not be such a good idea!! Arghh, I'm torn between putting it on the roof or putting it on the back! Either way, the wheel is coming out to make more space. I'll let you know what I decide, thanks for the input folks! The carrier on Spongbobs is the Devon one. Looks good but is it a pain in the bum to work on the engine with it there. Swing out units are better. Though I removed mine because I fancied giving the bus a new look I'm in the unpopular gang and like them on the front. Personally, I love clean lines all the way around a bus. So my spare wheel will stay in the rear well. And when we go camping, it'll come out and be used as legs for the coffee table in the awning or, if it's just a one night stay and we're not putting up an awning, I'll slide it under the bus. After all, you're not using the bed when you're driving around. So what's wrong with keeping it in the rear wheel well? One advantage of having the spare on the front is that it gives you somewhere to put your mug of tea. Have just seen this on eBay. A bespoke and reasonably elegant solution, though a bit pricey if you add the cost of a towbar as well. Not if you're standing at the back of the bus.. I'm also deciding what to do spare wise myself, in a Westy the wheel well is now the wardrobe so you don't use it anyway, there is a cupboard behind the driver seat for the wheel but i need that for my propex plus some shelving, i don't want a wheel on the front so i am toying with just putting it on the floor in the van and then throwing it under when parked, i like the devon rear option and the swingaway but i don't want to drill my van. i like the devon rear option and the swingaway but i don't want to drill my van. My bus is as high as yours (riding high is the only way for me) and folk often say 'that looks a little higher than stock height'. Do you get that too? One thing's for sure, stock height does seem to vary from bus to bus. Why is that? Anyone know? True^ do they do it in CHROME?